Quilt top from Jacquie Gering's Slice and Insert workshop! This technique is somehow both calculating and brainless at the same time. Putting the blocks together was a bit more work than the blocks themselves, but in the end, I'm super happy. I'll talk more about the process of choosing colors on the finish post. This will be a wall-hanging for our bedroom. On to quilting soon (just need to pick a backing...)! Renee's progressive medallion quilt! I added the Cotton and Steel stripe/metallic (<3) border. Now I'm playing with cross stitch blocks (Pile O' Fabric has an excellent tutorial). I have plans for one more border after this, then I'll pass it on. Haven't Renee and Laura done such an amazing job? Finally, even with school/professional development days and lots of tutoring this week, I finished (!) 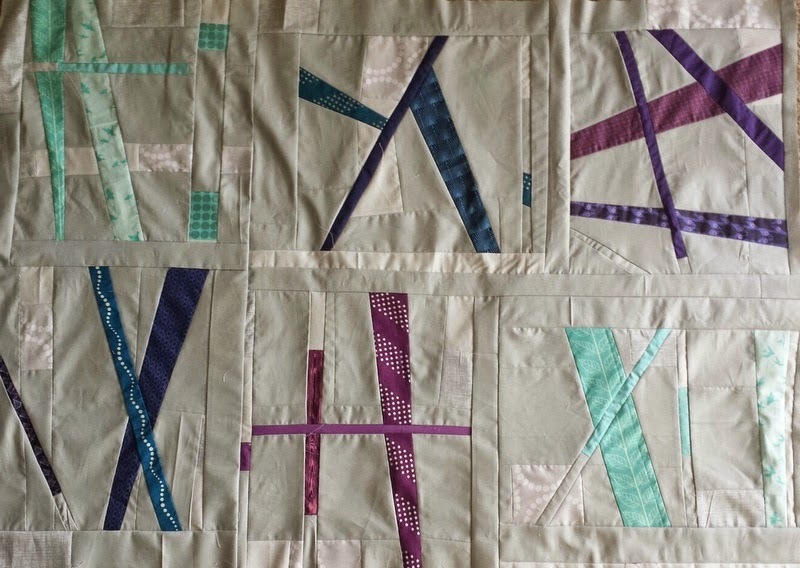 my Sister's Ten Quilt #2! More on Friday but for now I'm enjoying it just out of the wash - all crinkly and autumnal and perfect! 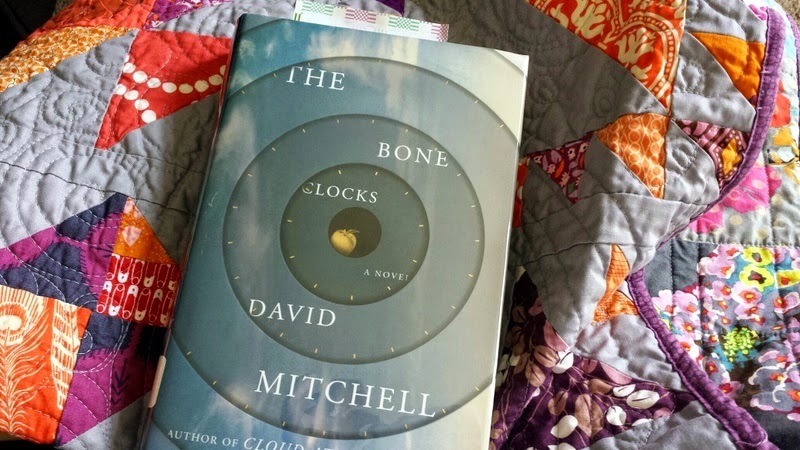 I started reading The Bone Clocks by David Mitchell (it came out yesterday) and I am SO excited. There's nothing like a good book - especially one that's never been opened. Anyone else a fan of Mitchell's work? I've so far only read/loved Cloud Atlas but I'd like to read more of his other books. As a sidenote, thank you to Becca of Sew Me a Song for renewing sponsorship of Quilty Habit this week! :) Your support helps so much! What gorgeous wips! I love the slice and insert quilt top, although I think I would think too hard about it for it to work for me (maybe?). I'm not a very good improv-er. I've never heard of David Mitchell, but perhaps I'll have to try one of his books. There's nothing like a good book while snuggling in a quilt! 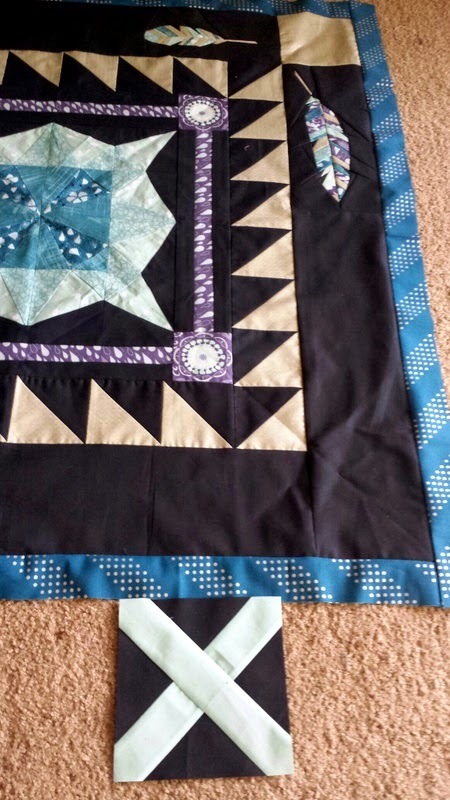 I love your slice and insert quilt! Those colors look so lovely and calming together. I'm so intrigued with what you are doing with my quilt! :-D I can't wait to see where you go with it!! And I can't wait to see your finished quilt! Your week sounds like mine -- school and lots of tutoring. I'm glad you fit some quilting in. I still have to work on that. Perhaps tonight I shall unpack some boxes in the sewing room and declare that good progress. Your slice & insert is looking really great. You got all the pieces to line up really well, and the floating inserts are a nice touch. The round robin quilt is looking good. I think the X's will be a neat addition.